Superior performance thanks to a compact driver installed in every condition (back of the luminaire up to 200 m remotely), providing the highest performance for all installations, no matter if it is a first tier stadium, a recreational field or an area. 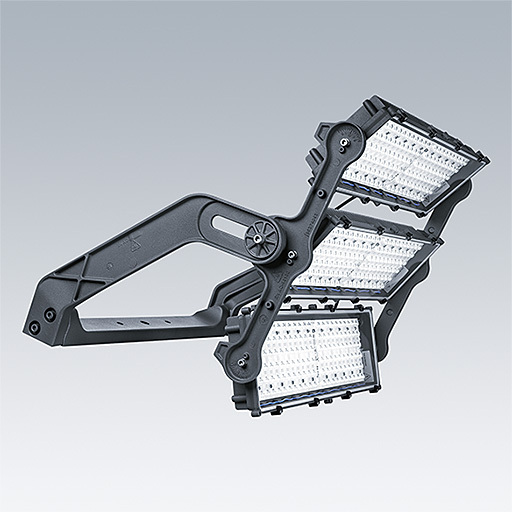 Fully controllable solution via Dali or RDMDMX enabling instant lighting, stepped illumination levels and event lighting with dynamic lighting scenarios. Stirrup fixed using different fixation points (3 bricks: one Ø22mm hole and two Ø15mm holes - 2 bricks and 1 bricks: one Ø22mm hole, two Ø17mm holes and two Ø15mm holes). Frame fixed to stirrup with M10 Hex screw and M8 set screw with the possibility to move (100mm) the position horizontally (available only on 3 bricks version). Tiltable LED modules fixed on frame. Reversable stirrup allows hang down position and different moutning configurations including suspension.